UN Refugee Agency UNHCR is building a settlement for 600,000 Rohingya refugees in less than six months. In a perfect world, site planning for buildings would always be a snap—no precipitous inclines to navigate, no threats of catastrophic flooding, and temperate weather conditions free of gale-force winds or freezing storms. But designers and project managers know that ideal building conditions are all are too rare. And with the effects of climate change, steady (if slightly slowing) population growth, and an ever-decreasing number of ideal building sites, builders have begun to get creative. Whether it’s building structures at high altitude, tapping geothermal energy in the driest desert on the planet, or helping refugees find shelter in a landslide-prone areas, designers are finding new ways to conquer difficult terrain. Here are six stories of dangerous and adventurous construction projects that show how design ingenuity and careful planning can overcome inhospitable building environments. Imagine having to plan a city for 600,000 people—and you have only six months to do it. That’s the challenge facing the UN Refugee Agency UNHCR, which has been racing against the clock to build a home for Rohingya refugees in Bangladesh. 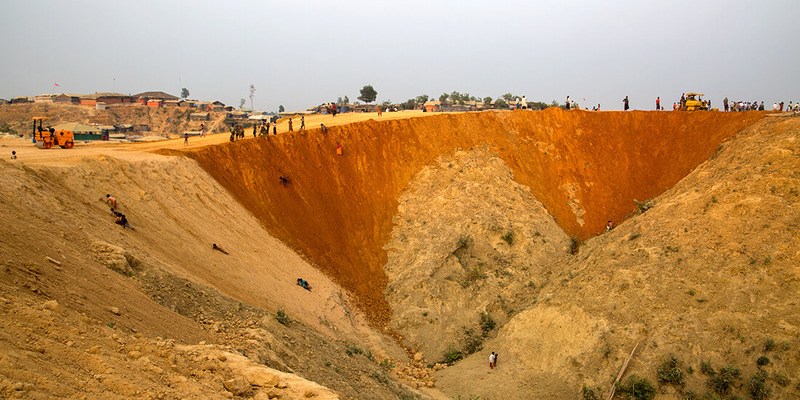 With the monsoon season looming, architect and site planner Phoebe Goodwin and her team have been using Autodesk Civil 3D to map the existing settlement to identify structures susceptible to landslides—a task that could save the lives of perhaps thousands of refugees who managed to survive the horrors of genocide in Myanmar. Watch now. Take the driest desert on earth—Chile’s Atacama Desert—and then add a freezing, windswept plateau that rises 4,500 meters above sea level. Sound like an ideal place to build a power plant? Although the site conditions proved hostile, for Chile the lure of plentiful geothermal power proved too big a temptation to resist. To keep the $320 million project on budget and on deadline, designers took a host of factors into account: the need for a solar-based energy supply while the plant was being constructed, as well as staggered shifts for workers prone to altitude sickness. Now generating 48 megawatts of geothermal energy, the plant also provides permanent electricity access for the local indigenous tribes that supplied the labor. Read more. Pikes Peak in Colorado’s Rocky Mountains may afford jaw-dropping views, but it’s not an easy place to live and work. For construction firm GE Johnson, which began building a 38,000-square-foot summit complex in June 2018, the mountain’s extreme weather and altitude requires rethinking every part of the process. That means extra waterproofing for buildings, off-site construction, and—like the Cerro Pabellón geothermal plant—measures to keep workers safe from altitude sickness. However, building in extreme conditions isn’t new for GE Johnson—the company recently completed a resort rebuild in Death Valley. Read more. 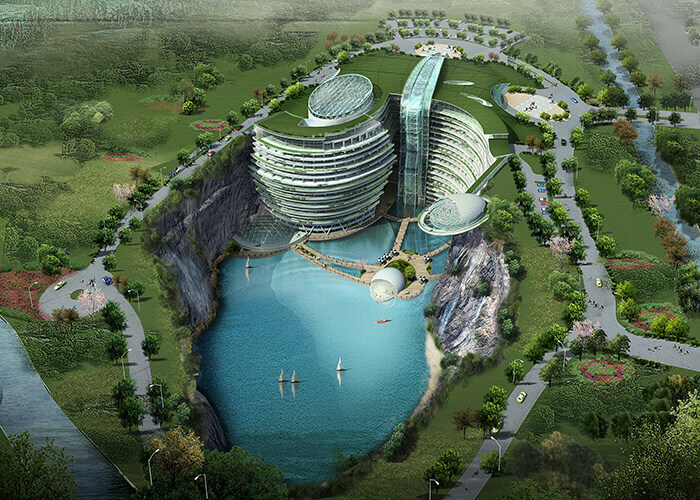 In Shanghai, an abandoned quarry site is being transformed into a luxury hotel that extends two stories underwater. Courtesy Atkins. What can be done with an abandoned quarry? For most people, the answer is “not much.” But in Shanghai, British firm Atkins and its local Chinese partners saw opportunity in a derelict quarry, which will become an 18-floor luxury hotel with two submerged levels that will include a restaurant. As the project’s chief engineer put it, building a vertical structure in the lake that fills the quarry amounted to a “fight against gravity.” Originally begun in 2013, the oft-delayed project is back on track and staring to take form. Read more. The Taklamakan Desert, home to the Uyghur people of northwest China, seems like a terrible place to put a highway—though traders once traversed the burning sands on the famed Silk Road, the very name of the desert has been said to mean “the place of no return.” Only two highways cross the desert, but now China is building a new route that will connect the northern county of Qiemo with Yuli in the south. Workers have to deal with a host of problems—extreme heat, sandstorms, and water scarcity, and each kilometer of highway is constructed via the oldest technology around: the human hand. Read more. As Chile celebrates its geothermal plant in the Atacama Desert, its neighbor to the north, Peru, has engaged in its own bit of high-altitude construction: a hydroelectric project 130 miles east of Lima in the Andes Mountains. Designed to supply more reliable power to mining ventures in the mountains, the Huanza Hydroelectric Project includes a 40-meter-high concrete gravity dam on the Pallca River and a conveyance system that moves water 712 meters down to a powerhouse. Getting there meant developing penstocks that could function on nearly vertical terrain; meanwhile, workers had to travel on treacherous roads and deal with the ever-present issues of low oxygen and freezing temperatures. Read more.